You can make a case that the final drink inspired by some of the best films I was lucky enough to see at this year’s TCM Classic Film Festival is easily the best of the batch — the rest of which you can see for yourself here, here, and here. I wouldn’t say, however, that it’s worthy of the film that inspired it. That’s only because the movie that inspired is so stratospherically its own thing that it stands out among other film classics. If I had to make a choice, I’d much rather you saw the movie than tried my drink. Fortunately, however, there’s no reason you can’t do both! You can read a little bit about my impressions of “A Matter of Life and Death” from five years back in my review of a DVD set, “The Films of Michael Powell” (fortunately still available from Amazon for a reasonable price, and also as a DVD rental from Netflix). Suffice it to say the film was the personal favorite of an English filmmaker who was every bit the equal of such contemporaries as Alfred Hitchcock and David Lean. He famously befriended Martin Scorsese and married his editor, Thelma Schoonmaker, but his latter day influence extends far beyond that. The important thing is that he made film as a form of healing magic with a dash of wry, realistic humanism that was witty, occasionally sensual (but not quite sensuous), and nearly always as British as British could be — but he did so with the help of a brilliant WWII-era expat Hungarian screenwriter/producer named Emeric Pressburger. In “A Matter of Life and Death” (alternately titled “Stairway to Heaven,” way pre-Led Zeppelin), a young poet and war-hero (David Niven) who really should have perished along with his plane, finds himself very literally on trial for his life and his love of a American radio operator (Kim Hunter) while undergoing post WWII-era neurosurgery. It all happens in Ward No. 5 and I thought that would be a fine name for a drink that revives the mind and the soul and won’t be too horrific for the body, either. Combine the liquid ingredients in a cocktail shaker, shake vigorously, and strain into a good size cocktail glass. Toast life, but also death — without one, you can’t really have the other. Cocktail enthusiasts may suss out that this drink is a slight variation on the very coincidentally named Ward 8, a lesser known classic-era cocktail — a mite tart for my taste — that I covered back in ’11. I’ve replaced the North American whiskey of the original for supremely English gin but kept the life-giving fresh citrus juices. Shaving off half an ounce of hard booze, I’ve also added the healthy properties of ginger…okay, ginger liqueur, but the alcohol is needed to salve the mind, right? 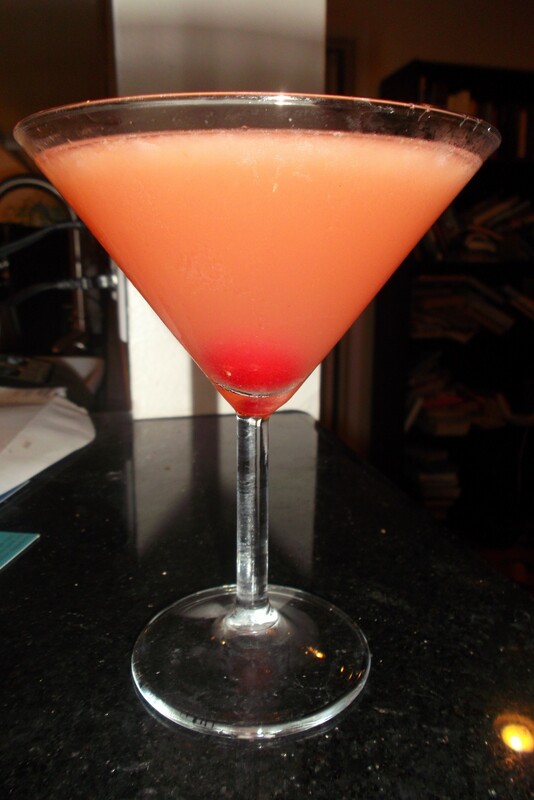 It’s a refreshing concoction but fairly sensitive and delicate. I tried changing out the Bombay Dry Gin for a very good but more elaborately flavorful gin and it throw the balance off in a way I wasn’t sure about. I also tried the drink with only 1/2 an ounce each of the orange and lemon juices and that result let a bit more of the gin’s perfume through. I went with a more refreshing and accessible take on Ward No. 5. I don’t know what effect using a different brand of ginger liqueur would have on this drink because I only had one around, but the brand I’m using is very tasty. I’m not saying that only because I got it free, though freebies always do taste that much sweeter. All in all, in rather proud of Ward No. 5, but I’m humbled by the beautiful, funny and tragically delightful movie that inspired it. I’m also rather happy to present the scene that gave me the idea for this final TCM-esque beverage. Considering I’ve never noticed it on a menu, and never tried it myself until about a week ago, there’s a really good chance you’ve never had yourself a Jack Rose. In fact, this once standard drink might now be completely forgotten were it not for assorted mixed beverage historians and its appearance in two famed books: a walk-on in Ernest Hemingway’s ultra-boozy depressive classic, The Sun Also Rises, and a leading role as one of the six basic cocktails featured in David Embury’s 1948 The Fine Art of Mixing Drinks. That Embury could place this now obscure beverage alongside such ur-cocktails as the Daiquiri, the Manhattan, the Old Fashioned, and the Martini indicates that this was once a drink that appeared to have some real staying power. So, what happened? Well, the Jack Rose is not based on whiskey, gin, or rum but on applejack, which is not a sweet cereal for kids but an American apple brandy that fell into disrepute for decades. I’m here to tell you that both the spirit and the drink are really very good — and it’s likely even better versions are out there. More on that, after the asterisks. Combine the liquid ingredients in a cocktail shaker with plenty of ice. Shake vigorously, strain into a chilled cocktail, and toast the printing press, the Internet, and all other means of storing memories. Now, nothing this good has to die forever. If you’ve had the French apple brandy, calvados, then you’ve had apple brandy but you haven’t had applejack. Brewed in New Jersey’s Monmouth County, Laird’s Applejack is pretty much the only game for what was once an ubiquitous American hard liquor. Apparently, part of the issue was that the traditional method of distilling hard apple cider into the applejack by freezing excess water sometimes had some seriously unfortunate chemical results. Happily, I’ve been enjoying quite a bit of Laird’s Applejack this week without the slightest threat to my life or eyesight. Indeed, I really liked the 80 proof Laird’s I was able to buy for a very reasonable price. A 100 proof version, which is very well reviewed and about $10.00 more per bottle, is theoretically available. In any case, it’s equally good with lime or lemon juice, but don’t try a Jack Rose with pricey but much better known calvados and think you’re having a Jack Rose — a Jacques Rosé, perhaps, but not a Jack Rose. I found the calvados version of this drink a bit overdone and perfumey. With applejack, it’s a simple, balanced, refreshing drink that goes down as easy as any sophisticated cocktail you’ve ever had. It’s very nice. I’m sure it’s possible the drink could be more fully bodied and complex with the 100 proof Laird’s. I’m also sure it could be even better with a finer grade of grenadine. Now, you can buy some very high end grenadines or you can do what all the cool cocktail kids are doing and make your own. For us poor and lazy folks, the Master of Mixes grenadine syrup is probably the best choice for about five or six bucks. Here’s the deal. A really outstanding homemade or gourmet grenadine is mostly just a mixture of pomegranate juice and lots of sugar; most commercial grenadines seem to be a mixture of “natural and artificial flavors” and high fructose corn syrup, Master of Mixes splits the difference with a mixture of pomegranate and cherry juice and a bit of the ol’ high fruc. I’m sure it could be improved upon, but it’s been working pretty beautifully so far in a number of cocktails here. I know purists like David Wondrich would want me to make my own, and some day I just might. If you look around, there are plenty of recipes online if you’re so inclined — some are tantalizingly simple. 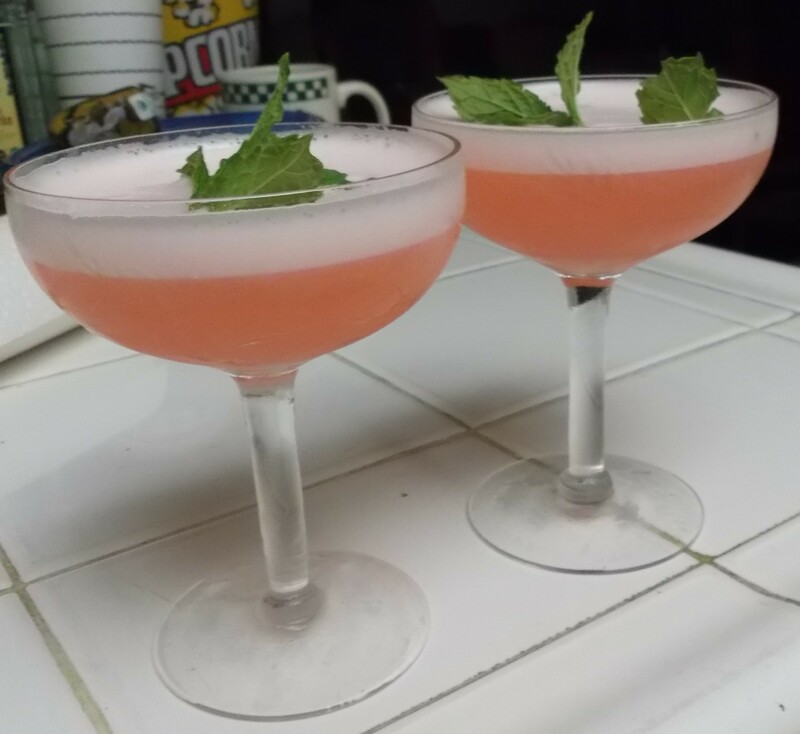 However, these posts are largely dedicated to the idea that making really good cocktails at home can and should be very easy. 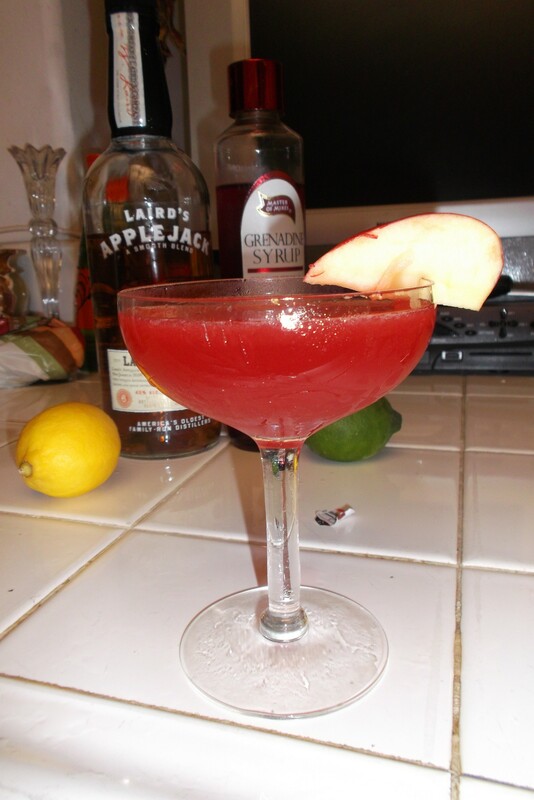 With a decent storebought grenadine and a tasty, inexpensive base spirit all cocktail fiends should check out, the Jack Rose is a great cocktail that you can make in about five minutes at home for, I’m guessing, less than $1.50 per drink. That’s something.